Maybe the best way of helping the busy database professional to get started with practical PowerShell-based administration is to pull together all the essential community cmdlets into a toolkit for the POSH DBA, and explain how and why you'd use them. Although, in a previous POSH article, we gave some reasons why DBAs should learn PowerShell, such as gaining more productivity and flexibility in administrative tasks, we must admit that it isn’t really that easy to give a complete answer to the question, “why learn PowerShell”, in a simple sentence. PowerShell isn’t the easiest of current programming languages to learn, so it is sometimes treated with a certain amount of mistrust. But this mistrust isn’t entirely justified. Its syntax can be a bit daunting for anyone trained exclusively in VB or C#, but is familiar to anyone who has used the Kern or Posix shell languages or Perl. Whatever prior knowledge you can bring to learning PowerShell, there is very likely to come a time when you decide you need to learn to use it in your day-to-day work. You don’t need to install PowerShell if you are using a relatively recent Windows operating system. Windows 7 and Windows Server 2008 R2 are shipped with PowerShell 2.0 and Windows 8 and Windows Server 2012 with PowerShell 3.0. Execution Policy. Are you being able to run scripts? Only scripts signed by a trusted publisher can be run. Downloaded scripts must be signed by a trusted publisher before they can be run. No restrictions; all Windows PowerShell scripts can be run. Profiles, don’t forget this best friend. Imagine that you have set up your entire scripting environment, with all the variables assigned, aliases defined and your function module imported into the session. Life seems good. Then, for some reason, you close the window for that session. When you open a new one, what will happen if you have not created your profile with all these settings? Is all lost and you will have to do it again. Not so good. Unless you thrive on tedium, it is important to create your profile. Once it is set up, you will no longer need to worry about what folder contains the function Get-XPTO or what the value of the variable $Something is set to, because every time you need it, all this information can be used by simply importing the module and environment settings in your Profile. This way, the next time you start a PowerShell session, all your environment configuration will be loaded. all users and all shells. all users, but only to the Microsoft PowerShell shell. only to the current user, but affects all shells. only to the current user and the Microsoft.PowerShell shell. The name is suggestive but no, it is not something to eat. In the Windows CMD command line prompt we had commands such as dir, mkdir, and rmdir. PowerShell also has built-in commands that ship as part of the shell. In PowerShell, these commands are called cmdlets, but they are much more versatile. PowerShell cmdlets are different from other shell commands such as the built-in CMD commands I’ve just mentioned. Cmdlets return an instance of an object, not text. Unlike text, these objects do not have a default formatting. As I’ve already mentioned in the previous article, everything in PowerShell is an object, and commands do not process and output text, but objects. Note: In PowerShell, commands are not built in to the PowerShell.exe executable, but they are instances of the .NET Framework class System.Management.Automation.Cmdlet which is defined in the assembly System.Management.Automation.dll. Hmmm….Objects? An object is a representation of a physical entity with defined boundaries whereas a class is an abstraction of a set of objects that have similar properties, common behaviors and relationships with other identical objects. The class is the encapsulation of objects in common. Each object has its own characteristics, properties and methods. A property represents something the object has, and method represents what it can do, specifying the action itself. You may imagine your dog, Rex, as an object. It has the property size, weight, color but also has the methods runs, barking and sleeping. In PowerShell these concepts are fully applied. Any output of a cmdlet is an object with properties, methods and other specific member types. One example of this is the Get-Process cmdlet, which lists all the running processes on the machine. It has the StartTime property that indicates the date and time that the process was started, but also has the Kill method to end the process. Because PowerShell deals with objects, it can use the full power and range of features in the .NET Framework. Note: The term Object Orientation, or OOP, was created in 1967 by Alan Kay who created the Smalltalk language. Even before this, more specifically, earlier in 1967, this concept was already used by Johan Dahl and Kristen Nygaard and applied in the language Simula 67. Despite being widely used in recent years, the concept of OOP is more than 40 years old. There is a special convention for naming PowerShell cmdlets. This differs from that of any other shell. This syntax is one of verb-noun, with a restricted range of verbs that each have a precise meaning. This makes it so much easier for you to find a cmdlet and have a reasonable idea what it does. For example, the set of cmdlets that return some information has “Get” as its verb. The cmdlets that export objects start with “Export.” This allows you to determine what types of formatting you can use by simply looking for cmdlets that have a “Format” in the verb. Hey Get-ChildItem, can I call you Dir? I’m pretty sure you’ve enjoyed a movie directed by Allen Stewart Konigsberg or one that Frederick Austerlitz has acted in. You probably like the music of Anna Mae Bullock. You think not? You’ve never seen a movie by Woody Allen, or one who starred by Fred Astaire? You’ve never listened to the tunes of Tina Turner? Yes, all these monikers are artistic names or aliases. PowerShell also has aliases for its cmdlets, but why use aliases? They’re easier to remember and spell aren’t they? Demetria Gene Guynes is her real name but you remember her as Demi Moore. It’s the same with PowerShell. For many of us, it’s easier to type Dir than Get-ChildItem, just as it’s easier to remember Demi Moore than Demetria Gene Guynes. In Brazil, all cars are at least part-powered by Ethanol. This biofuel that is produced by sugar cane, cassava, corn or beet, is widely used in Brazil as a sustainable alternative to gasoline. Factories turn sugar cane into sugar and feedstock and send the cane-waste (bagasse) to other factories that convert this into Ethanol. Each type of process is self-sustainable, with a well-defined function. One produces the bagasse and the other, the distillery, then processes it into the fuel. Someone has to deliver the product of one to the other to be turned into biofuel. As the factories are usually separated by a few kilometers, a pipeline is the best connection between them, taking the cane-waste to the ethanol factory. Note The property CPU does not return the percentage of CPU used by the processor but the amount of processor time that the process has used on all processors, in seconds. Type Get-Help Get-Process -full for a complete information. Here, you are “piping” the output of the Get-Process cmdlet, to Sort-Object cmdlet and “piping” this to the Export-CSV cmdlet. You did ââa relatively complex task with a single line of script. Some Cmdlets you must know. In this example, we are doing one operation in two different alternative ways. At first the Get-Process cmdlet is passed as parameter and the second it is piped to the Get-Member. There are two points here. One is the $_ ‘automatic variable’. This represents the current object in the pipeline and, when used with the .CPU, tells the Where-Object to filter on the CPU property. In this case, Get-Process sends one object at a time to the Where-Object and it uses the CPU property with the automatic variable, $_.CPU, to check if it is above 100. If it is, the object is passed through the pipeline to the next cmdlet. If it is not, then it is removed from the pipeline. This automatic variable is often used inside flow structures, for example, ForEach-Object. For comparison on character data, there is also -like and -notlike. These two operators accept ‘*’ as a wildcard. That means if I compare ‘SQL Server’ -like ‘*SQL*’, will be true. PS C:\> Get-Process -ComputerName "Server1","Server2"
These are some of the most important cmdlets and functions that we will use at this series of articles. As I said earlier, PowerShell has a vast content of cmdlets for you to explore. If you are traveling through Europe, I doubt if you’d take all your belongings with you. You will pack your suitcase with essential items. Modules in PowerShell do the same. Modules encapsulate, in a reusable unit, all the most important functions that you use all the time. This makes these functions easier to maintain, and makes it easier for you to share them with others. There are four different types of modules in PowerShell, but the script module is the most important one to start with. We will use this to set up the environment for the examples in this series of articles. This type of module has the extension, psm1 and can contain any valid PowerShell code. Our module file will be called Functions.psm1. Note PowerShell 3.0 made it unnecessary to explicitly import the module using a cmdlet. Now, the module will be automatically loaded the first time you use a function that is within it. You can choose whether to use this feature or not. You must create a new folder in any of these paths with the same name as the module and put all the files belonging to it inside this folder. How many times have System Administrators lost a night’s sleep because they must perform a single operation in a number of remote servers? Almost every working DBA has I suspect. Let’s start with a short, simple example of how PowerShell can help with this task. Windows PowerShell remoting uses WS-Man, a Microsoft implementation of a systems-standard management protocol. This is a new feature in PowerShell 2.0 that enable users run PowerShell commands on remote machines, with operations that can be performed using one-to-many remoting (1:N).In other words one user is able to perform actions in many Servers with a few lines of commands encapsulated in a script. The next step is to write an example PowerShell script that creates a remote session for each server in turn and deletes files older than twenty days from the current date. The files are located in the c:\oldfiles folder directory. VERBOSE: Performing operation "Remove File" on Target "C:\oldfiles\Files - Copy (10).txt". VERBOSE: Performing operation "Remove File" on Target "C:\oldfiles\Files - Copy (11).txt". VERBOSE: Performing operation "Remove File" on Target "C:\oldfiles\Files - Copy (12).txt". VERBOSE: Performing operation "Remove File" on Target "C:\oldfiles\Files - Copy (13).txt". #A – Open a remote session for each computers listed in c:\PoshForSQLServer2012\Servers.txt. #B – Invoke the command asynchronously to delete files older than thirty days from the current date and store it in PowerShellJob Variable. 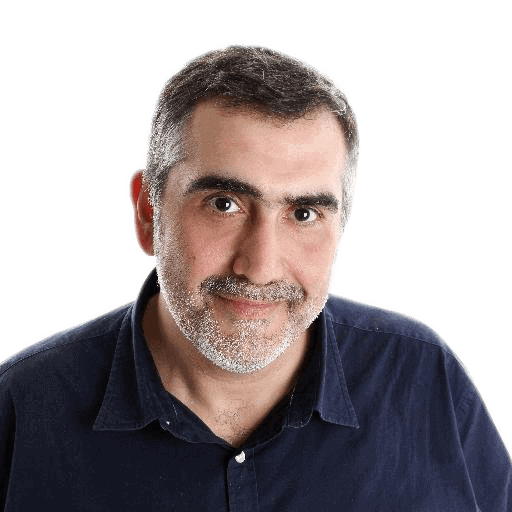 #C – Invoke the Jobs created. This is the kind of the power that system administrators can have in their hands. With a few line of PowerShell code they can control and manage a large number of servers remotely. No more sleepless nights, right? As part of the POSH DBA series, I’m providing a POSH PowerShell toolkit with a whole lot of Cmdlets, provided by the community of users, that are generally useful for anyone doing database administration. A lot of my examples that I provide will use them. As this series of articles is intended the provide some of the solutions that are run regularly by a DBA using PowerShell, we will have set up the environment in which the examples will run. You will have the code, example by example, of each article of this series in a set of PS1 files, and the functions used in the next articles will be in a module called Functions.psm1. All of them will be compressed in the file I’ll provide called POSHToolkit.zip. The other articles will have their own settings and will be listed in their subsections. The next step is to unzip the POSHToolkit.zip. In that file you will find the folder Functions and the ones with SQLPSX functions. Copy all these folders to the path %WindowsUserProfile%\Â­Documents\Â­WindowsPowerShell\Â­Modules. An important detail is that, for this function module to work in your computer, then SSMS should be installed or at least the SMO library. In many of the scripts that this series of articles describes, we will need to use a list of Servers Name and a list of SQL Server Instances Names. 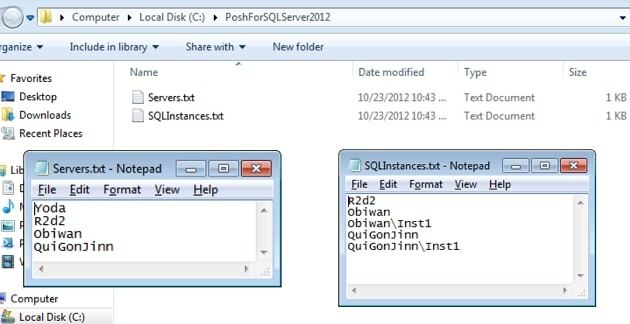 To standardize, we will create a folder called c:\PoshForSQLServer2012 and inside it two text files called Servers.txt and SQLInstance.txt and all the examples will use it. Figure 5 – Text files with the Servers and SQL Server Instance names used in this series of articles. Now your environment is set up. Let the fun begin. Note: PowerShell 3.0 introduces the auto load feature. It means that if you have the module in any of the paths of $psmodulepath variable, and you refer to any it cmdlet/function/script, it will be automatically loaded. There are many other concepts to study, such as PowerShell drivers and providers, worfkflows in the 3.0 etc… But I believe that these are the most core concepts. Uffa!!! This article was wearing to write, but essential. I hope it wasn’t wearing to read! We saw that PowerShell is already installed in recent versions of Windows, both client and server. We also commented on the power of remote administration on a day-to-day of the DBA professional using PowerShell. We described the basic concepts of PowerShell cmdlets and saw that they are not good to eat, but are actually PowerShell commands, and are the way you will speak to PowerShell. We understand that everything in PowerShell is an object. We discussed an object, class and properties. After that, we went a little deeper into the idea of cmdlets and why their naming conventions are so important. We saw that we can use aliases for them, to make them easier to identification and use. We touched on the the concept of pipelines between cmdlets was, and illustrated this with examples using some important built-in cmdlets such as Get-Help and Get-Member. The next step was to see that functions are most easily used, managed, shared and reused by using Modules, in our case the Script Module. 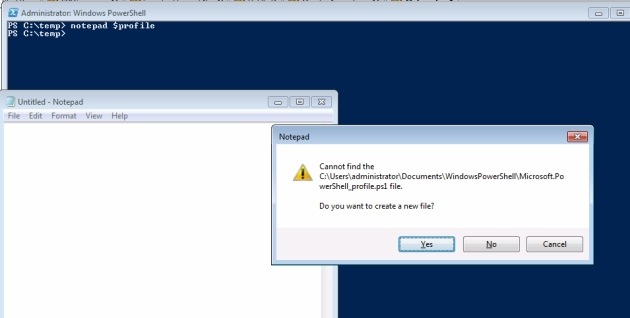 We also saw that the environment can be set up and used whenever you start a PowerShell session using the profiles and, by default, we cannot run scripts until we specify a suitable policy for their execution. Finally with all these concepts, we setup the environment to use the series’ examples. In the next article we will begin to really see how the PowerShell applies to SQL Server 2012 with the concepts of SQL Server PowerShell, or SQLPS. Hi, thanks for the article. I haven’t really made time to delve into PS but this was a nice quick way to get the basics on how it works as well as see a few examples along the way. Great introduction. A great post – very informative with good examples. licKeyToken=89845dcd8080cc91’ or one of its dependencies. The system cannot find the file specified. + add-type <<<< -AssemblyName "Microsoft.SqlServer.ConnectionInfo"
=89845dcd8080cc91’ or one of its dependencies. The system cannot find the file specified. Using the recommended execuition policy setting of RemoteSigned does NOT allow me to import the modules from my environment file. Trying the import with set-executinopolicy unrestricted results in an error from the SQLServer module that reads: "Also I am facing a lot of issue with PowerGUI, issues"
My friend, I will take a look and fix it. Jfkeefe do you unblock de files ? I hope that in one of your articles you cover PS debugging. In the past I have totally confused myself by pipelining several cmdlets — and getting the wrong answer. I can’t always determine what I did wrong so anything that assists me (e.g. debugging) is valuable.